Fish Kept: 13" French Angel, 10" Emperor Angel, 8" Passor Angel, 10" Queen Angel Blueline/Huma/Niger/Clown/Blue throat/Undulated/Golden Heart trigger fish Achillies 6"/Naso - 12"/Powder Blue 5"/Powder Brown 3"/Blue 5"/Vlamingi 5"/Bariene -2/Purple/Yellow/Sohal 5"/Desjardini Tangs Broom Tail 8"/Banana Wrasses 7" Dalmation puffer 6", Miniatus Grouper 5", Snow Flake Eel 20"
Corals/Plants: Plastic plants, decorative coral. All rock is live but copper is used only when needed and then water changed out. Advice: Feed 95% Seaweed sheets 3 or more times per day. Only feed silversides once per week for eel and grouper. ALL other fish eat Seaweed. ALL are extremely healthy, fat and growing inches each year. Almost NO fighting, just mild pecking order. Feed well and fish are happy. Whenever I add a new fish I dose the tank with Nitrofurazone once and let it run in tank for about 3 days and then water change out. I've had core group of fish now for 2 years. I try to keep phosphates low. 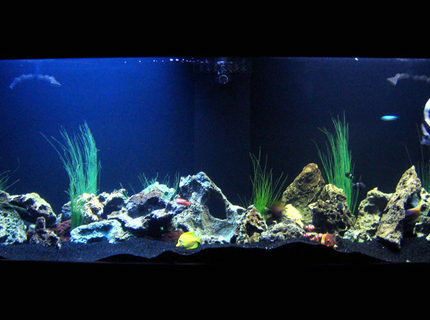 Description: 2.5 year old 210 Saltwater Fish Only Tank with 4 different large Angels, 7 Triggers, 12 Tangs, Eels, Puffers and more! 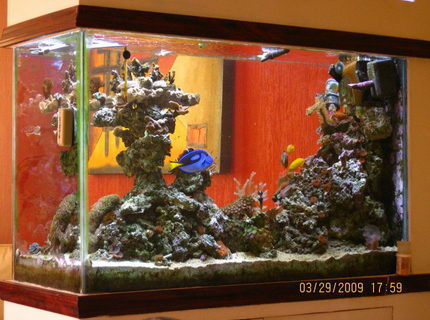 About Yourself: I've been around fish tanks for about 6 years. I've had my own for about 4. As I've upgraded, i've added to fill the tank and make it look nice. Advice: Take your time and go slow. While every fish has it's own "Personality", each species has it's own general traits. Description: 310 Gallons. The dimensions are 96in x 32in x 24in. Individual Pictures of the fish coming soon. 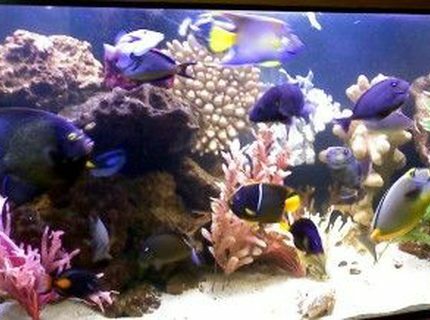 Fish Kept: Powder Blue Tang, Heniochus, Blue Tang, Yellow Tang, Sailfin Tang, Clown Fishes, Niger Trigger, Striped Damsels (avoid damsels - they're a pain! 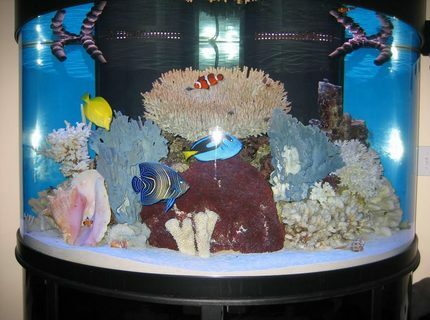 ), Green Chromis, Green Serpent Star, Electric Blue Hermit Crab, Cleaner Shrimp, Lots of Hermit Crabs, and a Blue Lobster. 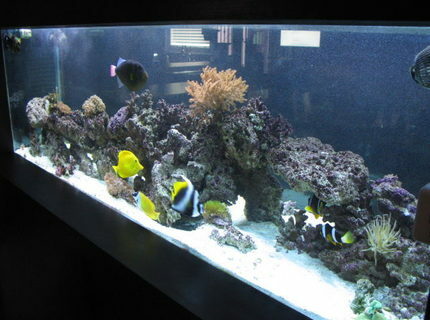 Description: 130 gallon tank with Powder Blue Tang, Heniochus, Blue Tang, Yellow Tang, Sailfin Tang, Clown Fishes, Niger Trigger, Striped Damsels (avoid damsels - they're a pain! 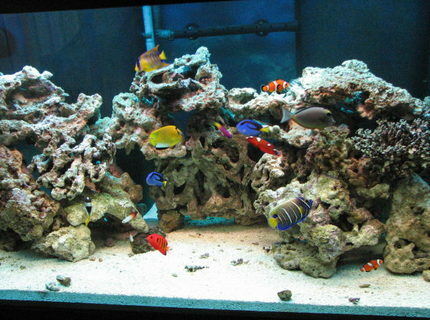 ), Green Chromis, Green Serpent Star, Electric Blue Hermit Crab, Cleaner Shrimp, Lots of Hermit Crabs, and a Blue Lobster. Advice: Be patient and have a lot of fun. Internet research can help you with a lot of problems. Start small and gradually go bigger. 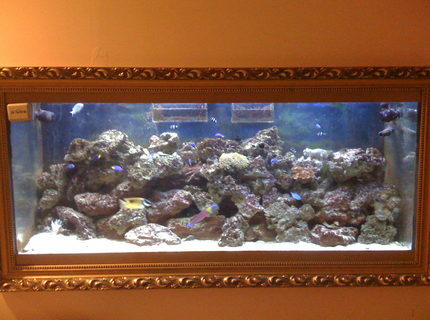 Description: Over 60 pounds of live rock, several cheap fish and wonderful experience building my own fish tank. 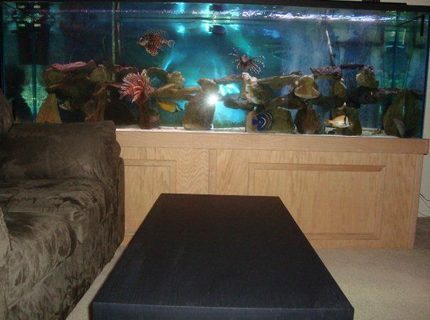 I have couch next to the mine fish tank. Takes only a few minutes to fall asleep. Mine filtration set up allowed me avoiding water change drastically. Multistage set up was created after many errors and adjustments. Thank you for taking your time and expressing your vote. 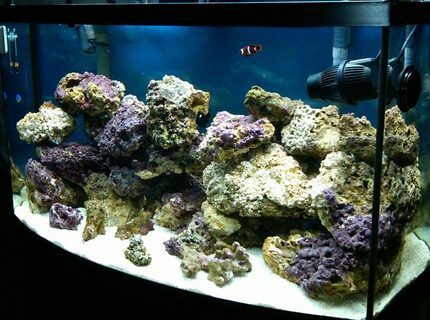 Fish Kept: For now just some chromis , a couple of damsels, bullet goby, six line wrasse and a coral beauty !!!!!!!! Corals/Plants: fake coral from LIVING COLOR !!!!!! Description: My renovaded tannk !!!!!! new stuff to make even better !!!!! About Yourself: This is the third fish tank we have set up in our house and was our Christmas present to ourselves. 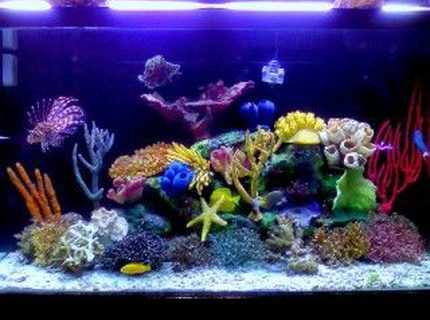 Advice: We collected large pieces of coral for a year before we knew we wanted to buy the tank, so we had the pieces that we liked when we got the tank and wouldn't have to settle for what we could find (and afford) all at once. About Yourself: First tank, just started 3 months ago.